Sri Gnanaparameswarar Swamy Temple at Naalur Mayanam (Thirumeignanam). Naalur Mayanam is situated at a distance of about 16 kms from Kumbakonam on the Kumbakonam to Kudavasal route (Via Thirucherai). After reaching Kudavasal, take diversion road from Athikadai bridge to Naalur and proceed further for about 2 kms to reach this place. 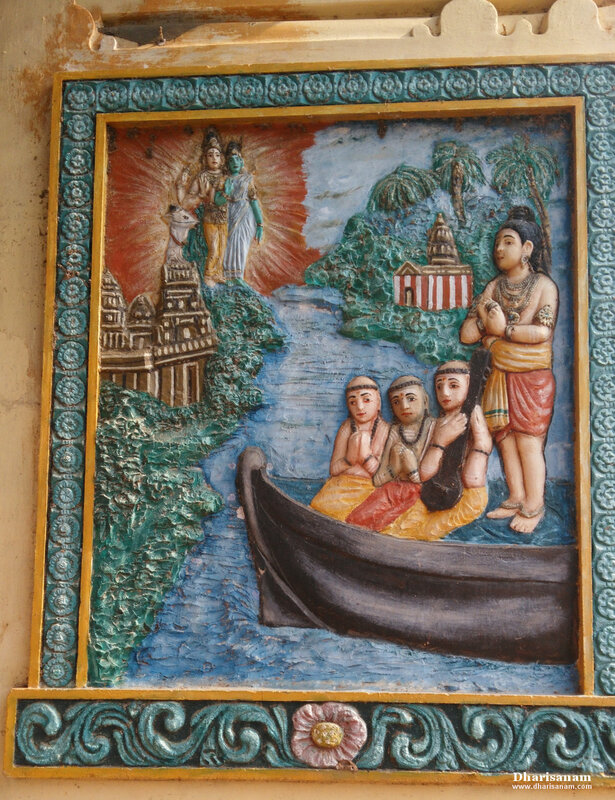 In Naalur, there is another Shiva temple, Sri Periya Nayagi with Sri Palasavaneswarar, which is a “Devara Vaippu Sthalam”. This is a Madakkoil built by king Kochengat Cholan. Other Devara Paadal Petra Shiva Sthalam near this place are – Kalayanallur, Karukkudi, Sivapuram, Kudavasal, Naraiyur Siddheecharam, Thirucherai, Arisirkarai Puthur, Penu Perunthurai, Thalaiyalangaadu, Peruvelur, Karaveeram, Kaduvaikarai Puthur (Andankoil) and Thiru Kollamputhur. 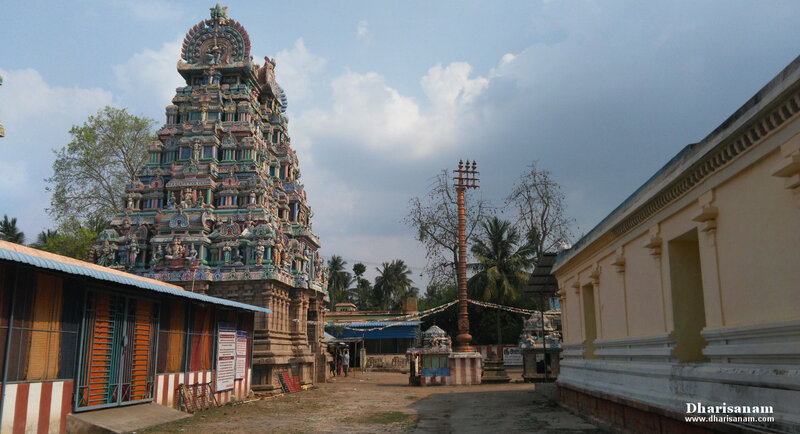 This is one of the 276 Devara Paadal Petra Shiva Sthalams and 96th Shiva Sthalam on the Southern bank of the river Cauveri in Chozha Nadu (Thenkarai). This east facing temple has no main tower (Rajagopuram) but has a beautiful entrance with sculptures of Lord Shiva and Goddess Parvathy. The last consecration ceremony (Maha Kumbabishekam) took place on 24.01.2007. It is believed that this temple was originally built in the early Chola period and later on it was built using granite by Aditya Chola-I. There are 23 stone inscriptions in this temple which date back to the periods of various Chola kings starting from Paranthaka Chola-I. 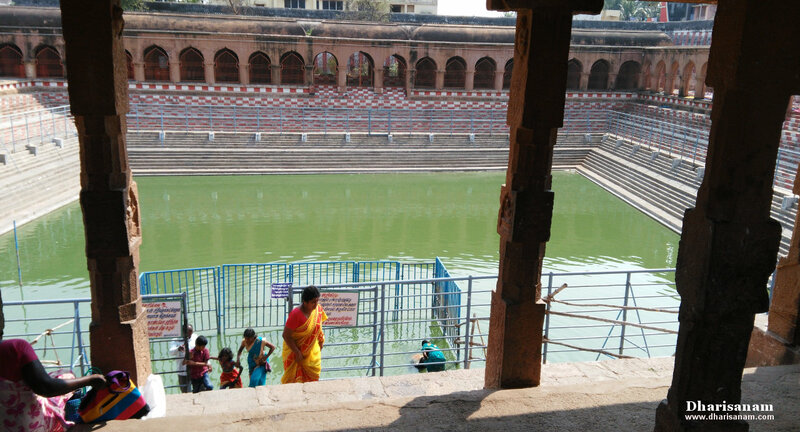 The historical names of this place are Chaturvedi Mangalam, Thirumayanam and Thirumeignanam. Thiruvamathur is located at a distance of about 8 kms from Villupuram on the Villupuram to Gingee route. Other Devara Paadal Petra Shiva Sthalams near this temple are – Thiruvennainallur, Thiruthuraiyur, Thiruvathigai, Thirumundeecharam, T.Idaiyaru and Thirunavalur. 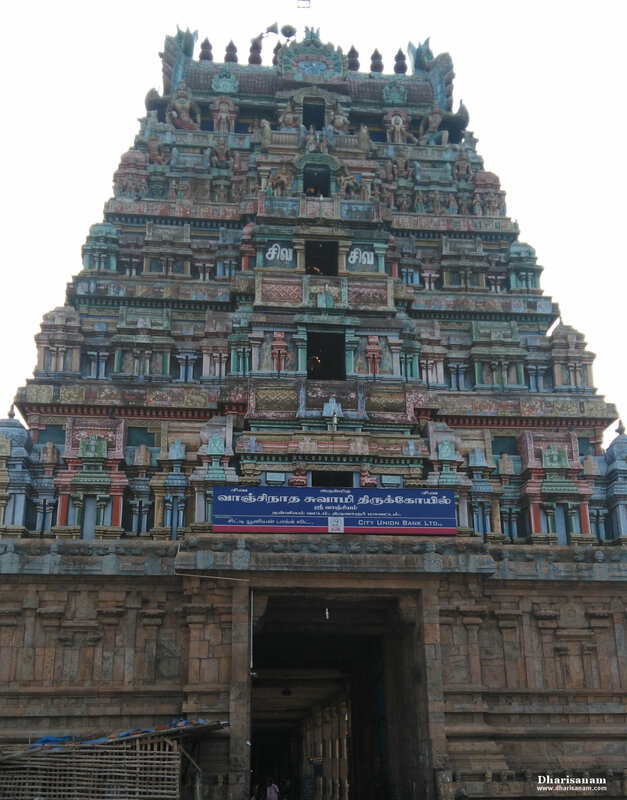 This is one of the 276 Devara Paadal Petra Shiva Sthalams and 21st Shiva Sthalam in Nadu Naadu. Lord Shiva’s idol has the impression of a hoof at the top. There are multiple rivulet markings which signify that this lord was worshiped with milk that flowed from udders of cows. Inscribed on the chest of Goddess Muthambikai’s idol here is a small piece of what looks like a snake’s tail. There are two separate temples here. Goddess Muthambikai’s temple is right in front of Lord Shiva’s temple. 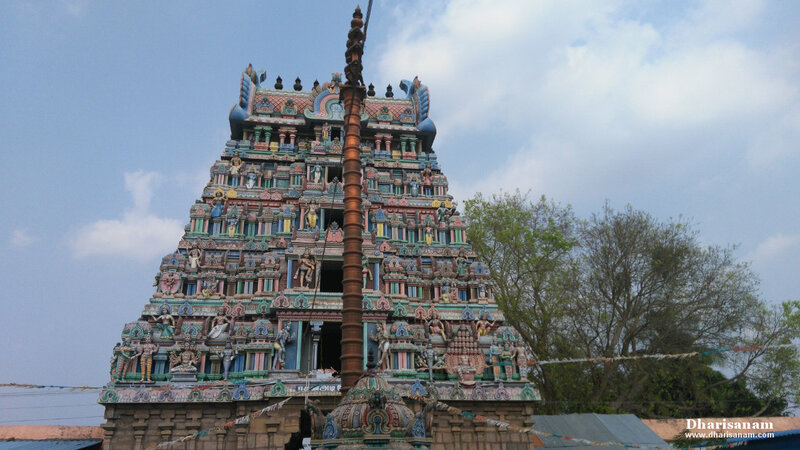 Lord Shiva’s temple has a 7-tiered main tower (Rajagopuram) with 2 corridors while the goddess’s temple has a 5-tiered main tower with a single corridor. Vannacharabam Sri Dandapani Swamigal lived in this place. The first “Kaumara Madam” was established here. Thiruvamathur is located on the banks of the Pampa river, a tributary of the Pennai river. The historical names of this place are – Gomathrupuram, Gomatheeswaram and Gomathupuram. This temple was originally built by the Pallava rulers. Later on, the Cholas made several endowments. This is evident from the stone inscriptions available here. At a later date, Achutha Deva Pallavar is believed to have renovated this temple. There is an idol of Achutha Deva Pallavar here. In this temple, there are stone inscriptions that document the histories of 26 kings from 955 to 1584 AD. The important kings among them are Rajaraja Cholan-I, Rajendra Cholan-I, Rajathi Rajan-I, Kulothungan-I, Vikramathithan, Sadaya Verman, Vikrama Pandian and Krishnadeva Rayar. 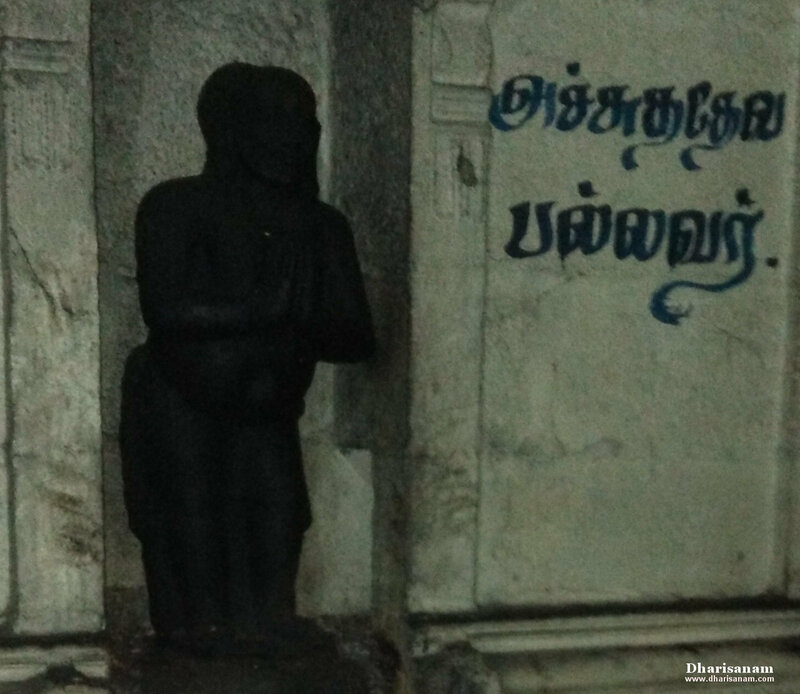 The stone inscriptions also reveal that a Chola king sanctioned a grant that helped several blind students learn the devaram hymns and sing them in the temples. Thiru Vanchiyam (Sri Vanchiyam) is located at a distance of about 30 kms from Kumbakonam on the Kumbakonam - Natchiarkovil - Nannilam route. From Nannilam, it is about 6 kms and from Thiruvarur, it is about 17 kms. Other Devara Paadal Petra Shiva Sthalams near this place are – Nannilam, Thiru Kondeecharam, Thiruveezhimizhalai, Serukudi, Thalaiyalangadu and Thiru Peruvelur. 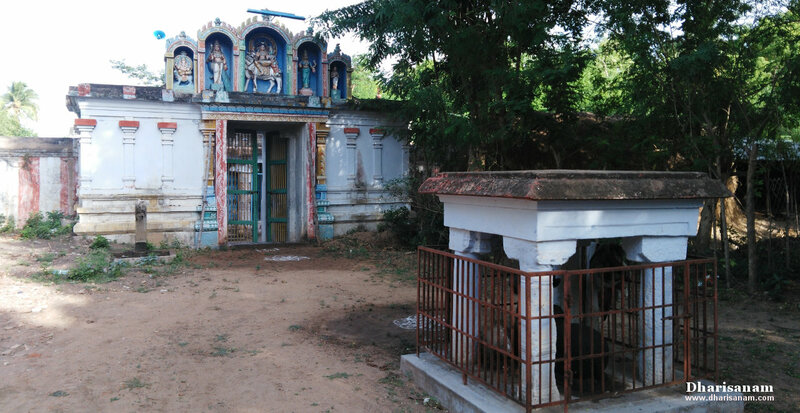 This is one of the 276 Devara Paadal Petra Shiva Sthalams and 70th Shiva Sthalam on the Southern bank of the river Cauvery in Chozha Nadu (Thenkarai). This temple is famous for Lord Yama’s shrine. Devotees worship the lord here and seek his blessings for a long and prosperous life. This temple is famous as a Rahu-Ketu parihara Sthalam. This place is called as the “Mount Kailash on earth” (“Bhoologa Kailash”). 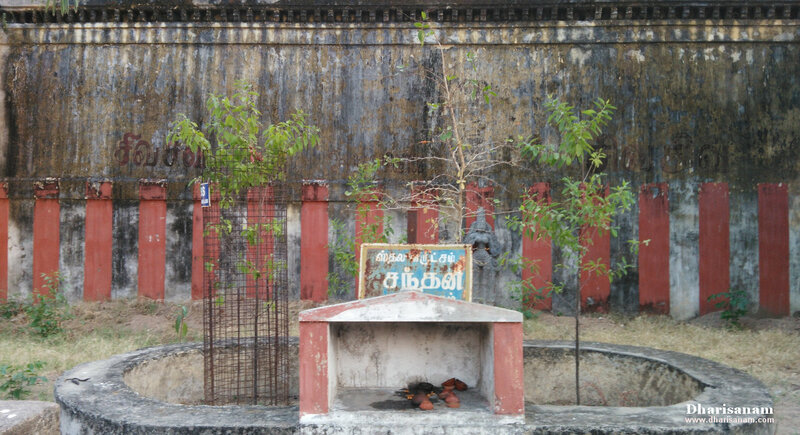 This is one of a few Paadal petra sthalams where the “Nalvar” (the four saints - Saint Thirugnanasambanthar, Saint Thirunavukarasar (Appar), Saint Sundaramurthy (Sundarar) and Saint Manickavasagar had rendered their Pathigams. 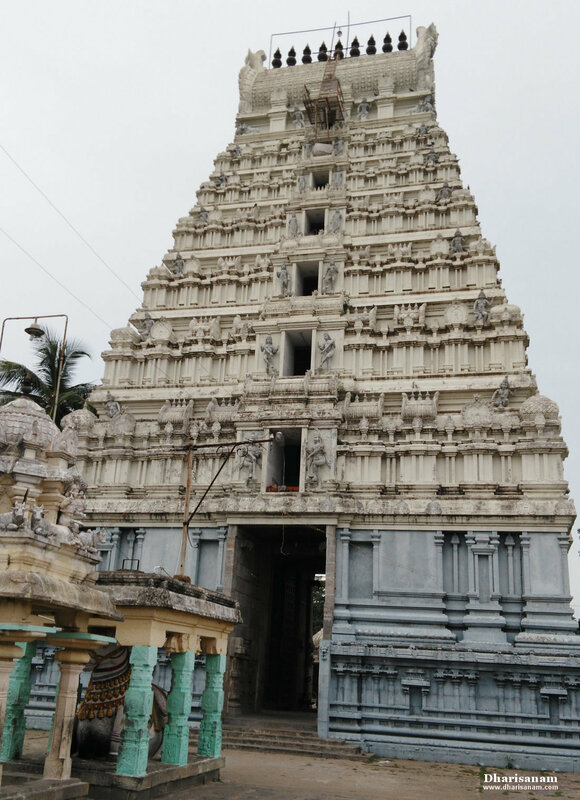 This east facing temple has 3 corridors and its main tower (Rajagopuram) has 5-tiers. The last consecration ceremony (Maha Kumbabishekam) took place on 10.04.1989. This is one of the six Shivasthalams on the banks of the river Cauvery which are considered to be very sacred and are equivalent to Kasi (Banaras). These are Thiruvengadu, Thiruvaiyaru, Chaayavanam, Mayiladuthurai, Thiruvidaimarudur and Thiruvanchiam (this temple). According to Hindu mythology, at the end of every “Yuga”, there is a huge flood (deluge) that leads to the destruction of all living beings on the earth. This is called the “Pralayam”. It is believed that this place was not destroyed even at the end of the “Pralayam”. It is believed that in each of the four Yugas the idol of Lord Shiva takes a different form. It is considered to be made out of gemstone (Rathinam) in Kretha Yuga, gold in Thretha Yuga, silver in Dvapara Yuga and granite in Kali Yuga. There are 27 stone inscriptions in this temple which date back to the periods of the later Cholas, Pandiyas and Nayakkars. This temple was originally built by Chola King Rajarajan. The historical names of this place are Vanchiyapathi, Santhanavanam, Thiruvaraiyur, Bhukailasam and Gandhaaranyam. Visited on: 25th March, 2018. Thirunageswaram is situated at a distance of about 8 kms east of Kumbakonam on the Kumbakonam to Karaikkal route. From Thiruvidaimaruthur it is about 5 kms. There is a railway station in Thirunageswaram on the Kumbakonam to Mayiladuthurai route. Other Paadal Petra Shiva Sthalams near this place are – Thiruvidaimaruthur, Kumbakonam (3 temples – Kudamukku, Kharonam and Keezhkkottam), Aduthurai, Thiruneelakkudi, Thiruvavaduthurai, Thirukkozhambam, Therizhanthur, Kuthalam, Thirumanancheri, Velvikkudi, Ethirkolpadi and Mayiladuthurai. One of the famous Vaishnava temples, Oppliyappan Koil (Lord Venkatesa Perumal of Thirupathi) is very close to this place. This is one of the 276 Devara Paadal Petra Shiva Sthalams and 29th Shiva Sthalam on the Southern bank of the river Cauvery in Chozha Nadu (Thenkarai). This is a very famous “Parihara Sthalam” for Raahu dosham. 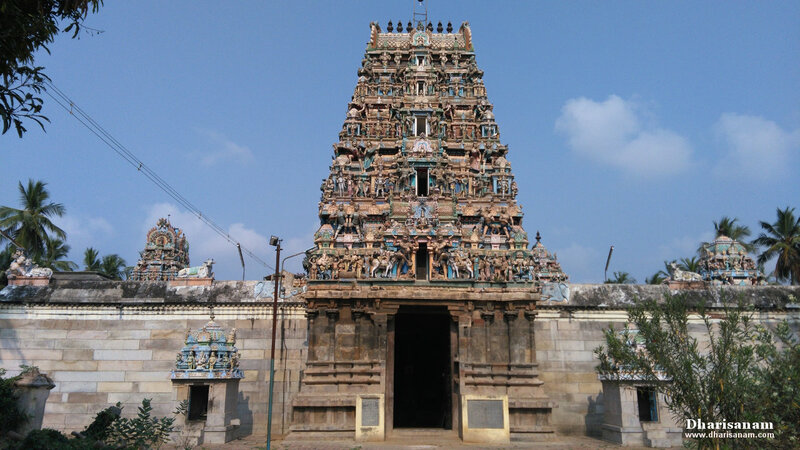 This east facing temple has three corridors and its main tower (Rajagopuram) has 5-tiers. There are 6 other towers (Gopurams) in this temple. The last consecration ceremony (Maha Kumbabishekam) took place on 15.08.2005. According to legend, in ancient times, this region was a forest densely covered with Shenbaka trees. Hence this place gets the name Shenbakaranyam and the lord is praised as Sri Shenbakaranyeswarar. The historical names of this place are Shenbaka vanam and Girikannikai vanam. There are 16 stone inscriptions in this temple which date back to the periods of Chola kings Kandarathithan, Raajarajan and Rajendran. This temple was originally built by Kandarathithan. Later it was renovated and extended by Saint Sekkizhar and Govinda Dikshithar, a minister in the kingdom of Achuthappa Nayakkar. Visited on: April 1, 2018. Thiru Nallur is situated at a distance of about 15 kms from Kumbakonam on the Kumbakonam – Papanasam – Tanjore route. After Sundara Perumal Koil, take the diversion road at Uthani village and proceed further for about 2 kms to reach Nallur. From Papanasam (via Vazhappazhakkadai) Nallur is about 5 kms. Nearest railway station is Sundaraperumal Koil (3 kms) on the Kumbakonam to Tanjore line. 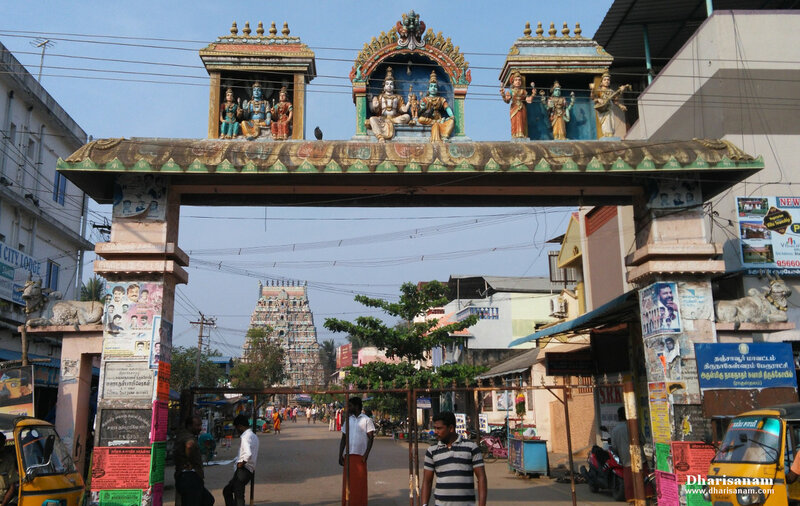 Other Devara Paadal Petra Shiva Sthalams near this place are – Patteeeswaram, Thiru Sakthi Mutram, Thiruvalanchuzhi, Pazhaiyarai, Thirukkarukkavur, Avoor, Thiruppalaththurai, Vada Kurangaduthurai, Thiruppazhanam and Thiruvaiyaru. This is one of the 276 Devara Paadal Petra Shiva Sthalams and 20th Shiva Sthalam on the Southern bank of the river Cauvery in Chozha Nadu (Thenkarai). This temple is counted as one of the Maadak Koils built by King Kochengat Cholan. This temple is also famous as “Then (Dakshina) Kayilayam”. The uniqueness of this temple is that the Shivalingam here changes its colour 5 times in a day. Lord Shiva granted his “Thiruvadi Deekshai” here to Saint Thirunavukkarasar. Amaraneethi Nayanar, one of the 63 Nayanmars, lived in this place and attained salvation. 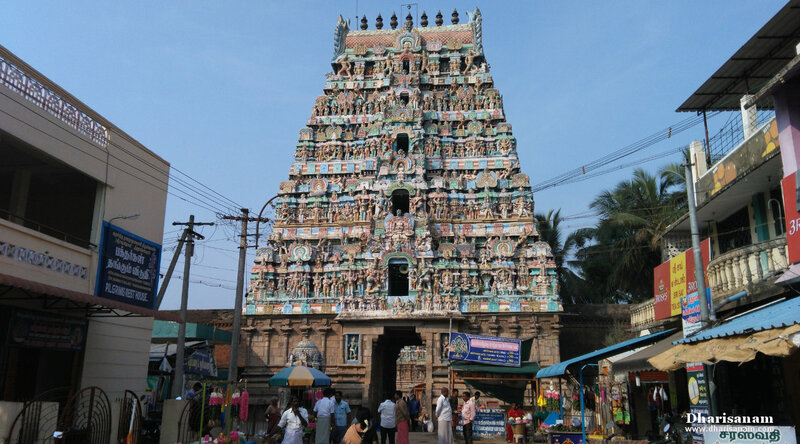 This east facing temple has three corridors and its main tower (Rajagopuram) has 5-tiers. The last consecration ceremony (Maha Kumbabishekam) took place on 30.08.2013 and prior to that on 11.09.1991. As per Hindu mythology, Adisheshan (the serpent on whom Sri Mahavishnu rests) and Vayu (lord of the winds) fought among themselves frequently to test their superiority. During one such struggle, against Vayu’s severe wind, Adhiseshan failed to hold on to the Mount Meru. In this process, two peaks of the mountain were dislocated and fell onto the earth, one at this place (Nallur) and the other at Aavoor, a nearby village. The Shivalingam here is believed to have formed from the mountain peak that fell here. There are 23 stone inscriptions in this temple which mostly date back to the periods of Chola kings – Uthama Chola, Raja Raja Chola and Rajendra Chola. A few inscriptions belong to the Hoysala and Vijayanagara empires. This temple is under the administrative control of Thiruvavaduthurai Aadheenam since the early part of the 13th century.